Kiernan is featured on the digital cover of Glamour UK. I have added the cover and outtakes to the gallery! I love this photoshoot. GLAMOUR MAGAZINE – “It’s 8am and I am wearing a novelty onsie. When you start loving yourself, life gets a lot more fun,” Kiernan Shipka tells me. This could be the life of any 19-year-old on the way to – or skiving from – university, but Kiernan is not like any other late teen you’ve ever met. She did, after all, make her TV debut at five months old in ER, before outshining her adult cast mates as Sally Draper in Mad Men, from the age of seven. The star of The Chilling Adventures Of Sabrina has called me while travelling to set for season two, where she’s been putting in 13-hour-days, up to six times a week for almost a year. Kiernan is in a reflective mood, talking about the realities of growing up in the public eye. Kiernan has a new beautiful photoshoot for L’Officiel Paris! Check out the outtakes in our gallery and read her interview below. I’ll add scans soon! LOFFICIEL – Matthew Weiner, the creator of Mad Men, recently considered following up on his masterpiece by saying, “The only reason is to see what happened to Sally Draper. 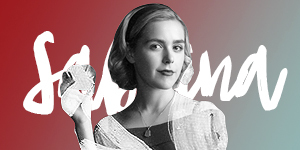 That I owe to Kiernan, she is the heart of this series.” By playing Sally, the impertinent daughter of advertising executive Don Draper, Kiernan Shipka, from 2007 to 2015, she was indeed made unforgettable. Her secret: to play this privileged little girl like a rebel, while showing that she remains a pure product of her conservative environment. Mad Men was also an opportunity for the actress to assert her style. Thanks to Sally Draper’s wardrobe, her performer, of Irish-Slovak origin, born in Chicago to parents totally foreign to the world of cinema and fashion, made the girls in Hollywood jealous, without having time to take the big head. Matt Weiner extended the scenes in which she appeared, and Kiernan built a golden reputation that allowed him to last in Hollywood, and to be today the star of Sabrina’s New Adventures. Second TV adaptation, this time quite dark, sometimes horrific, of an ultra-popular comic book, after the very kitsch one of the 1990s, this Netflix version is a modern rereading of Sabrina’s character, who must choose between two incompatible worlds: that of mortals and that of witches. Magic tricks, witty words about intersectional feminism, even Satan’s patriarchal authoritarianism… Kiernan dazzles Sabrina’s fans. “Sometimes you need an icon to play another icon,” says Roberto Aguirre-Sacasa, the showrunner of the series. SYDNEY MORNING HERALD Hollywood is littered with tragic stories and cautionary tales about child actors. Then there’s Kiernan Shipka, the unaffected young actor who grew up in our living rooms, playing Don Draper’s precocious daughter Sally between the ages of eight and 15 in the TV series Mad Men. 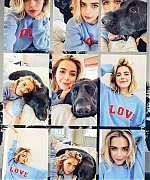 Now 19, the sassy blonde has come into her own, starring in the titular role in the Netflix series Chilling Adventures of Sabrina, the latest TV show to be based on the Archie Comics’ character Sabrina the Teenage Witch. This adaptation is a dark coming-of-age story, inspired by Rosemary’s Baby and The Exorcist, that follows the half-mortal witch Sabrina Spellman as she struggles to reconcile her dual nature. “It’s been so much fun,” Kiernan says, giggling into the phone from a taxi in Toronto, Canada, on her way to a doctor’s appointment on her day off from filming the romantic comedy Let It Snow. She’s excited about the upcoming second season of Sabrina, in which her character struggles with a deal she’s made with the devil. “It was cool because we shot both the first season and the second all in one and I felt like there was this natural progression throughout,” she says. “Sabrina grew up mortal, so that’s a more dominant personality trait in the first season. But as she comes into her power, it’s about exploring the other side of herself and she really goes all in. One of Sabrina’s more complex relationships is with her capricious Aunt Zelda, played by Australian actress Miranda Otto (the pair had just worked together on a horror film, The Silence, when they discovered they’d been cast as family in Sabrina). Kiernan Brennan Shipka was born in Chicago to John Shipka, a real estate developer, and his wife Erin Brennan, a one-time queen of Chicago’s St Patrick’s Day parade. Kiernan was only five months old when she made her acting debut in the long-running medical drama ER. STYLIST – Kiernan Shipka is having a blast. Jolene by Dolly Parton is booming through the photo studio speakers and Shipka is singing along at the top of her voice, living every word. Born in Chicago and raised in Los Angeles, Shipka made her television debut at five months old in ER before landing her role in Mad Men aged six. Sally, a strong-willed proto-feminist who rebelled against her parents, grew up on screen for nearly 10 years, as did Shipka. Kiernan has done a new photoshoot for The Telegraph! You can check out beautiful outtakes in the gallery and read her interview below. TELEGRAPH – Child stars tend to all grow up in the same way: early success, flailing box-office figures through puberty, parental emancipation, a very public skidding off the rails, a couple of stints in rehab, bankruptcy and finally, self-imposed isolation. The streamer has ordered another 16 episodes of the series, which will be split into two parts. Netflix initially ordered 20 episodes of the show, which was split into two 10-episode seasons. Season 3 and 4 will begin production in 2019. Season 2 is set to premiere April 5, 2019. The series also launched a holiday special, “A Midwinter’s Tale,” last Friday. “Chilling Adventures of Sabrina” imagines the origin and adventures of Sabrina the Teenage Witch as a dark coming-of-age story that traffics in horror, the occult and witchcraft. It finds Sabrina wrestling to reconcile her dual nature — half-witch, half-mortal — while standing against the evil forces that threaten her, her family and the daylight world humans inhabit. It stars Kiernan Shipka, Miranda Otto, Lucy Davis, Ross Lynch, Michelle Gomez, Chance Perdomo, Jaz Sinclair, Richard Coyle, Tati Gabrielle, Adeline Rudolph, Abigail Cowen, Lachlan Watson and Gavin Leatherwood. Jedidiah Goodacre will join the series as Dorian Gray along with Alexis Denisof as Mary Wardwell’s boyfriend, Adam Masters. Roberto Aguirre-Sacasa, who also serves as chief creative officer of Archie Comics, is the showrunner for the series. Aguirre-Sacasa executive produces alongside Greg Berlanti, Sarah Schechter, Archie Comics CEO Jon Goldwater, and Lee Toland Krieger. Berlanti Productions produces along with Warner Bros. Television. 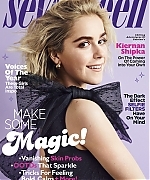 Kiernan is featured on the December cover of Seventeen! 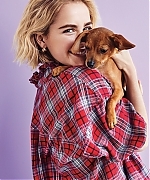 This shoot is SUPER cute and one of my favorites Kiernan has done. Check out the cover and some outtakes released so far to the gallery. The magazine hits newsstands on November 27, and we will add scans as soon as we get the issue. Enjoy! 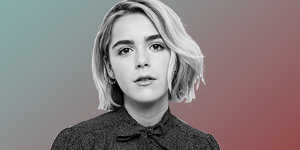 SEVENTEEN – Kiernan Shipka has been working as an actress for pretty much her entire life, but for years, the former Mad Men star was probably more on your parents’ radar than on yours. “I may as well have been a fly on the wall at the Kids’ Choice Awards,” she tells Seventeen in an interview. Now, with the 19-year-old playing iconic teen witch Sabrina Spellman in Netflix’s Chilling Adventures of Sabrina, she’s finally ready to welcome a new fan base: people her own age. “Having my friends be genuinely excited to watch the show is really cool,” Kiernan says. Get to know Kiernan and you’ll feel the same way about her too. An upside to having phones and social media has been so much more awareness of all the injustices and things going on in the world, and having a voice and platform that just didn’t exist before. It’s just really incredible to me—I feel like I can continually learn new things every single day. Recently on Instagram, I did the 10 Featured Teachers [campaign], and it was so amazing and such a beautiful experience to see all these teachers and kids getting books that they needed. It was very gratifying to see it actually have an impact in individual people’s lives and to [watch] thank-you videos from [people] who are just so, so happy to have a book that they’ve wanted…it’s just amazing. So more of that to come, for sure. I’m interested to see how we can take that hashtag and put it on a greater scale. She’s drawn to Sabrina’s girl power. TEEN VOGUE – Kiernan Shipka is a professional. At 18, her résumé reads longer than those of a lot of other actors. But even working steadily for over a decade — 12 years and counting — can’t prepare you for being tagged on Instagram as someone’s Halloween costume. Iterations of Sabrina have been in the works for years; at one point, creator Roberto Aguirre-Sacasa has said, the character could have shown up as the villain on Riverdale. But it is now a TV show, and it is dark and twisted and deals in horror, the occult, and teenage love triangles in equal measure. That it debuted in 2018, when almost everything feels horrible, might be nothing short of magic.